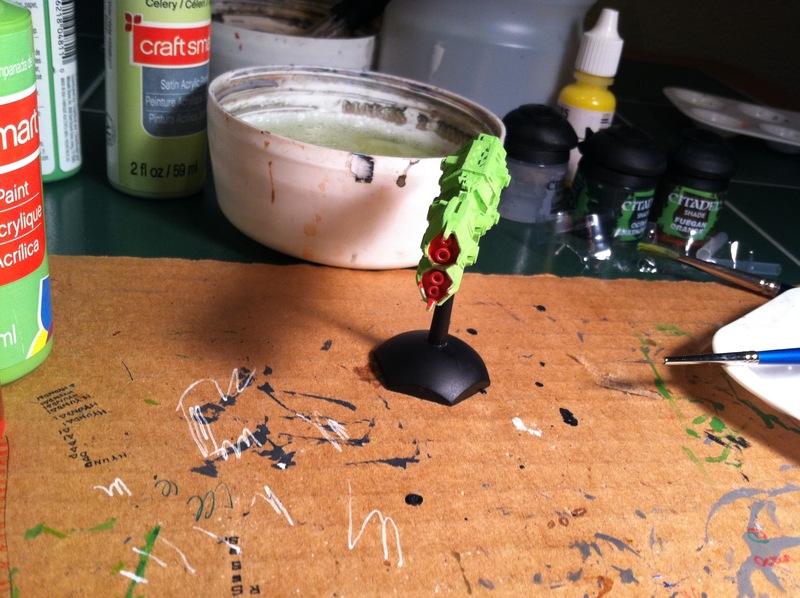 Someday I’ll learn: the most unassuming models usually end up being the best to paint. It was true of the Cold Navy models; I ended up liking the way the Mauridians painted up better than the Terrans, which was the fleet that drew me to Cold Navy in the first place. The same is true so far of the Studio Bergstrom stuff. 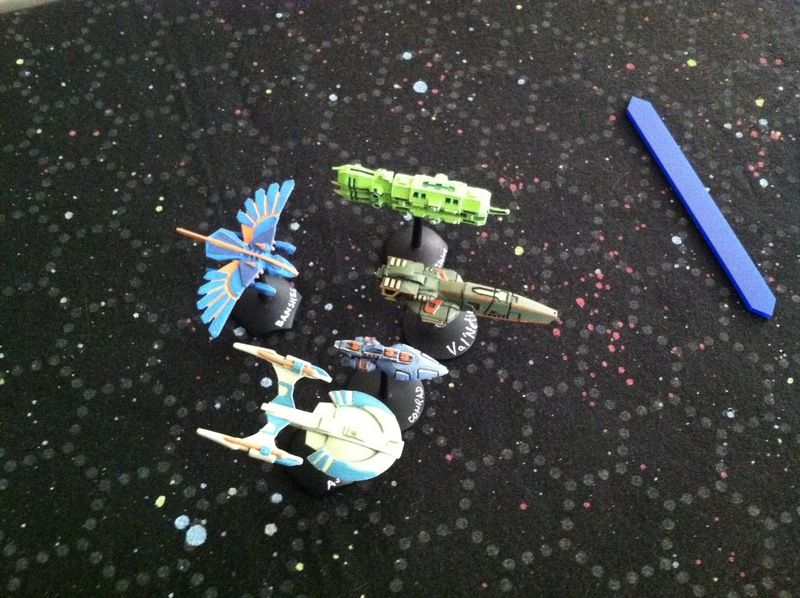 I made the order for the fighters, and added the ships just because. The Adjudicator has already convinced me to buy more Xuvaxi. Today, we’ll talk about the ORCDeF cruiser I got in the same order. They’re from the Future Frontiers line. Let’s start with some other angles. 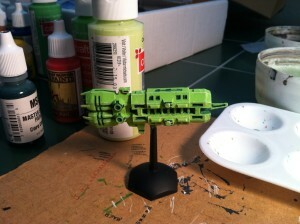 ORCDeF cruiser from the front. This is the cruiser from the front, where you can get a look at the anime-grade spinal mounts. 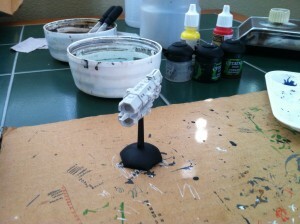 It’s primed white because I’m using a base color outside the Army Painter’s palette. ORCDeF cruiser from the rear. 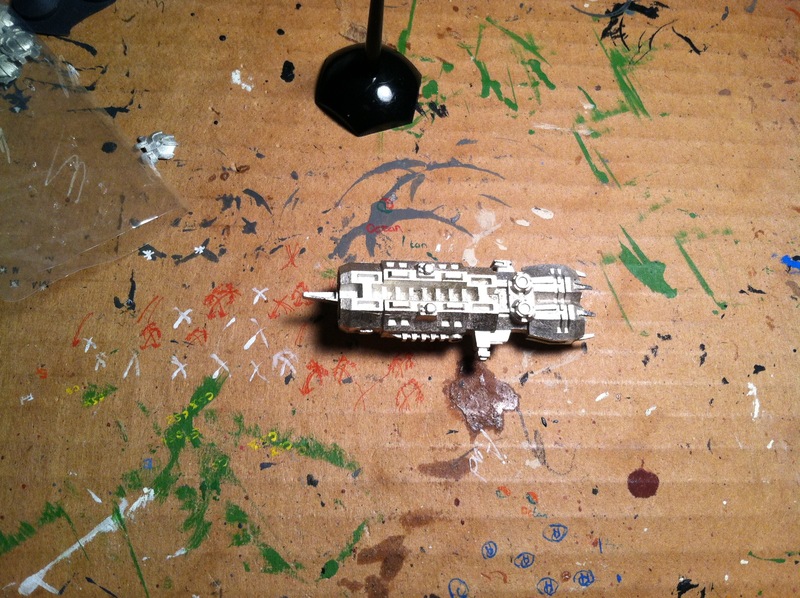 ORCDeF cruiser with a base coat. As you’ve probably guessed, there are a couple of features that must be painted differently: the engines, and the spinal mounts. If you guessed, “Reaper’s Explosion Orange,” you’d be wrong. (Well, mostly.) Instead, I went with Army Painter’s Pure Red. With the engines, I’m trying another glow technique, which is why the whole engine well is red, and not just the rocket nozzles. Next up are the washes. 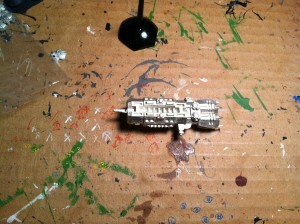 ORCDeF cruiser with a wash. Same angle, with a dry-brush. The other new thing is the use of a dry-brush. 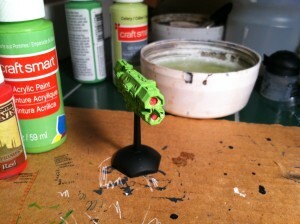 Normally, I don’t need them on spaceships, primarily because pin stripes in the right place do the same thing. But this ship is boxy, and full of sharp angles. A few pin stripes weren’t going to show them all off. 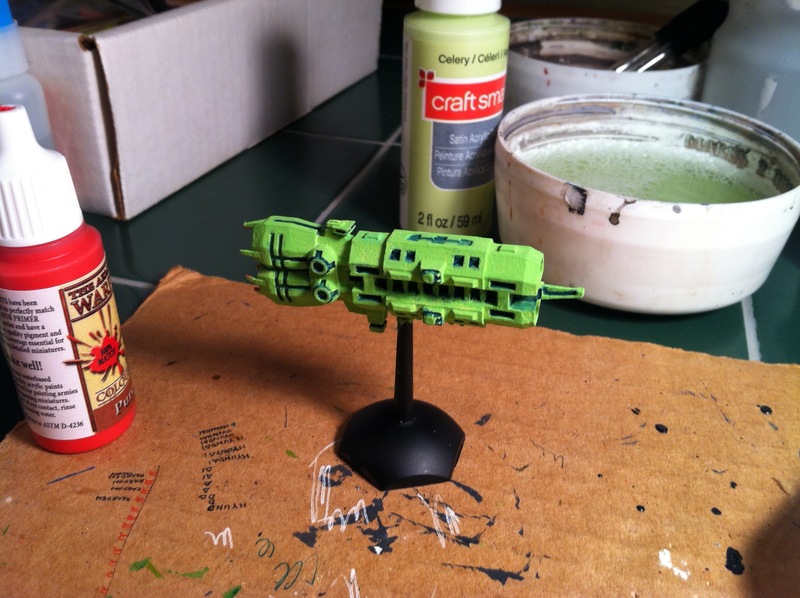 So I broke out another third of the Vomit Green Triad: the Craft Smart Celery. Because I hadn’t done much serious dry-brushing lately, it took me forever to do the job right. Spinal mounts with the gem technique. 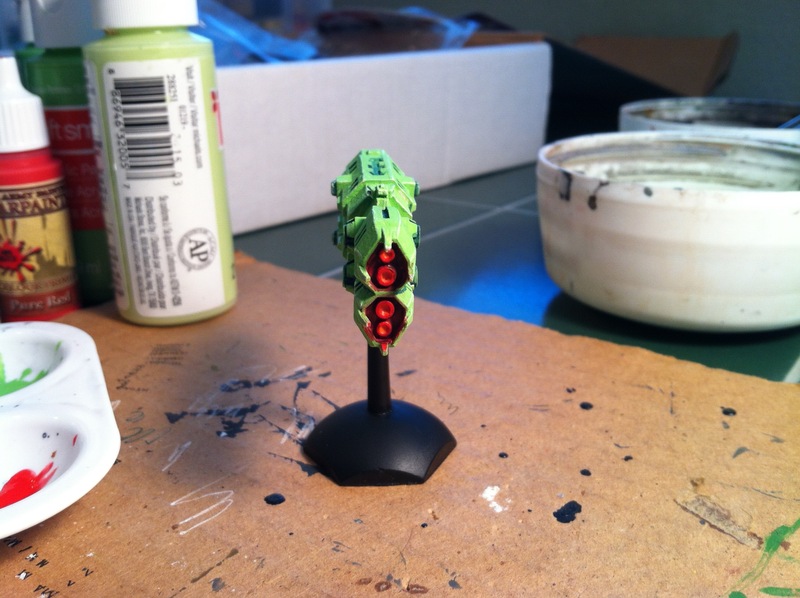 For the anime spinal mounts, I wanted to give them the feel of great big lenses, so went with the “gem technique.” I call it that because I learned it back the Stone Age, when I was playing Eldar, and every one of them had a gem somewhere on their model. It’s a simple technique: grab a darker color (Reaper’s Clotted Blood, in this case) and paint a swoosh over the lower right quadrant of the gem/lens. Then grab a really light color (this time, Reaper’s Pure White) and paint a swoosh over the upper left quadrant. 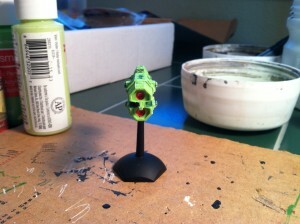 As the last thing you do, apply a gloss coat over the gem/lens (after you flat your model, if you choose to do that). The picture above was taken before the gloss. Trying to get the engines to glow. For the engines, I added some Reaper Explosion Orange to the center of the rocket nozzles, and repainted the edges of the nozzle red. The idea is that the whole engine well is lit by a red flare, with the nozzles as the center of that. It turned out OK, but next time, I may go with something brighter than the Explosion Orange to get more contrast with the reds. The last five ship classes. So I close with a group photo. If you choose to blow it up, take a look at the difference between the ORCDeF cruiser (now dubbed Gloire) and the Mauridian missile cruiser (the other green one). The Val’Netine doesn’t have a dry-brush on it, and it should be clear why. In the last picture, the ships are an ORCDeF cruiser, a Mauridian missile cruiser, a Terran frigate, a Xuvaxi heavy cruiser, and a Banshee. 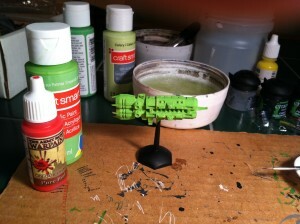 The frigate and the missile cruiser are from Ravenstar Studio, while the other three are from Studio Bergstrom. 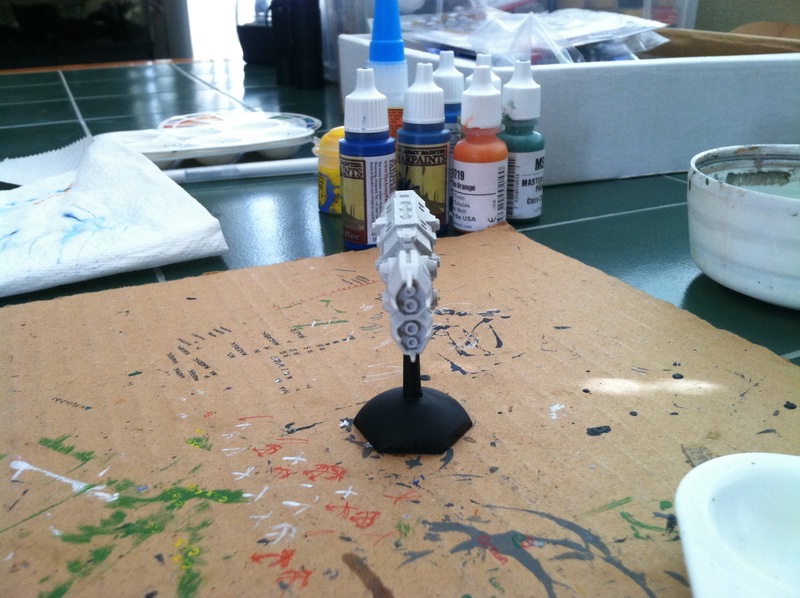 Paints that were used in the painting of the Gloire that were unmentioned: Reaper’s Pure Black, which was used to clean up the flight base’s post; and the Citadel Gloss Varnish. This entry was posted in third party and tagged Studio Bergstrom, workbench. Bookmark the permalink.